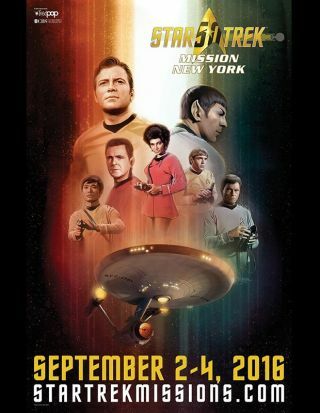 "Star Trek": Mission New York will ring in the show's 50th anniversary Sept. 2-4, 2016. NEW YORK — "Star Trek" creators, stars and avid fans — and NASA — will gather together this weekend (Sept. 2-4) to celebrate the 50th anniversary of the beloved franchise. "Star Trek": Mission New York will be held Friday, Saturday and Sunday at the Javits Center in New York City, and will feature a series of panels and premieres, as well as a show floor full of rare "Trek" goodies. You can grab tickets to the convention here, and check back on Space.com for in-depth coverage of the event. Other panels bring together creators and actors for particular "Star Trek" series, focus on the making of documentaries and video games about the series, and scrutinize the series through feminist, medical, racial, literary and even fashion lenses. Leonard Nimoy's children, Julie and Adam Nimoy — plus "Star Trek" creator Gene Roddenberry's son Rod Roddenberry — will sit on a panel about growing up along with the series, and there will be a "Meet the Writers" panel for the upcoming "Star Trek: Discovery" TV show. The convention will also feature the world premieres of "Star Trek II: The Wrath of Khan" in 4K, and the Smithsonian Channel documentary "Building Star Trek," according to StarTrek.com, and will also screen the new Leonard Nimoy documentary "For the Love of Spock" and another Nimoy-centric documentary, "COPD: Highly Illogical," each with a discussion panel afterward. There also will be a game room to try out new "Star Trek" games, such as "Star Trek: Bridge Crew," "Star Trek Online" and "Star Trek Timelines"; a "Star Trek" improvised musical show; a cosplay contest and even a spelling bee. "The arrival of Star Trek: Mission New York marks the return of the 'Star Trek' fan fest to the Big Apple," the convention's organizers, ReedPOP media, wrote in a statement. "The first 'Star Trek' convention, which helped spark the fast-growing experiential fan event industry, took place January 21-23, 1972, at the Statler Hotel — now the Hotel Pennsylvania." This newest venture will "entertain and engage thousands of 'Star Trek' fans for a new and different stand-alone experience," they added.